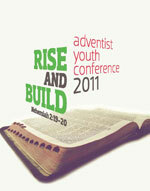 Adventist Youth Conference 2011 is a youth-led initiative to inspire and equip you to be a soul-winner and proclaim the everlasting gospel to this, our generation. The aim of this movement is to turn the training into action, as well as to provide an inspirational charge to challenge you to "Rise and Build". To Rise and Build a stand for God and His truth. Rise and Build your Bible study and prayer life like never before. Rise and Build our teamwork within our local church. Rise and Build to turn the world upside down by proclaiming the gospel and truth in our community and the world.